Getting the most out of a site visit. A site visit is great for getting a proper feel for a potential self build plot. This is a fun part of the plot search process and if you like what you see, it’s easy to get excited visualising the possibilities. Put the excitement to one side though as you should use the visit to gather some more information about your potential plot. You’ll have a reasonable idea of what to expect on your site visit from your desktop study but there’s no substitute for getting down there and getting “in among it” as they say. Find out if you like the plot. Check that the plot ticks your boxes – Characteristics, position and the surrounding area. Identify any issues that might have implications down the line in terms of design, construction and cost. Make a checklist of the things you want to look out for and take the property details, a pen, paper, tape measure and a camera to get plenty of photos to pore over when you get home. Explore the surrounding area and get a feel for it. Will you be happy there? Look for the transport links and amenities that were identified in your desktop study. Is there anything in the area that could pose a problem or put you off? Check through the property details and compare the information to what is there in front of you. Confirm the plot dimensions with a tape measure. Look for any obvious issues like a footpath across the middle, overhead cables or a mineshaft! Talk to people. If you see a neighbour, strike up a conversation. You never know what nuggets of information you might get. Note the position of adjacent buildings or structures to your site and consider how they might affect the design or interfere with the planning application. Are they close enough to be affected by the Party Wall Act? Are there any signs of cracks or subsidence on adjacent buildings, which could suggest ground movement? This doesn’t mean you can’t build there but further ground investigation may be necessary. A site visit allows you to assess the access options? Does the plot have road frontage or is it set back? Is access shared? Would you need to put in an access road? If so, how long? If new access to the public highway is required there are a few planning and highways requirements that need consideration. Details for requirements such as visibility splays can be found on the planning portal website. If there is planning permission on the plot then it is likely that access requirements will have been addressed. Have a look through the paperwork when you get home to see what they say. Another thing to bear in mind at this stage (especially if you are taking on the project management) is access for plant and material deliveries during the construction phase. Can large wagons access the site or is there going to be a size limit on delivery vehicles? Is the extent of the site marked by obvious boundaries, what are they and who or what is on the other side? Note the position of trees on and around the site. What species and how big are they? Trees can have a considerable affect on ground conditions and roots can physically invade foundations. Felling them can create a new set of problems. 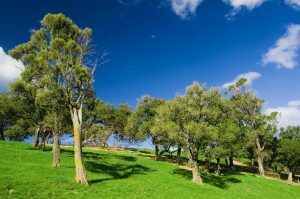 Locate trees that you have already identified as having Tree Preservation Orders. It’s worth keeping a look out for the dreaded Japanese Knotweed as well. It is possible to get rid of it but it’s either time consuming or expensive. Walk the site and look for evidence of disturbed, infill or made ground. Is there any sign of previous structures or contamination on the plot? Are there any watercourses and how does the ground feel underfoot? Is it boggy or holding water and is the vegetation indicative of wet ground with a high water table? What is the topography of the site? Does it slope? If it does excavation costs will increase. It may be necessary, depending on your findings, to dig trial pits or commission a borehole log to properly assess the ground before committing to a purchase. Speak to your designer about the need and the options. Locate service mains for your connections on a site visit. If there are adjacent properties it is almost certain that they will have service connections. Have a look on the pavement for access covers for water, electricity or gas supplies to neighbouring houses. You can get an idea of the mains route by joining the dots. If neighbouring properties have oil or LPG tanks then it might suggest that mains gas is not available in the area. Are there telegraph poles in the area? If your plot is a fair distance from the public highway, you may be facing considerable connection costs for services. Alternative energy supplies could be an option. As with services, have a look on the pavement, public highway and on site for manholes or inspection chambers. Once again, if the plot is a distance from the public highway then you will be facing hefty connection costs and a wastewater treatment or storage alternative might be a better option. The information you gather increases your knowledge about the plot and hopefully doesn’t turn up any major problems. If it does, don’t panic, there may still be ways to work around them. At least you know and can discuss them with your designer. The site visit gives you a chance to get a feel for a plot ‘in the flesh’ and you will probably get a gut feeling fairly quickly as to whether you like it or not. If you do then you need to do a bit more research before you take the plunge and sign on the dotted line.